Kolkata-based Garden Reach Shipbuilders and Engineers Limited (GRSE) touched a key milestone in its Project 17A today (10th November 2018) with the laying of the keel of the first of three advanced stealth frigates. 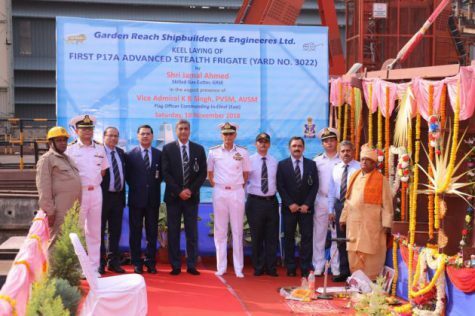 The keel was laid at GRSE’s Main Works Unit in the august presence of Vice Admiral K. B. Singh, PVSM, AVSM, Flag Officer Commanding-in-Chief, Eastern Naval Command. Rear Admiral V. K. Saxena (Retd. ), Chairman & Managing Director and other senior officials of the Indian Navy and GRSE graced the ceremony. Since its takeover by the Government of India in 1960, GRSE has delivered 98 warships – the highest number of warships deliveries made by any Indian shipyard till date. The Shipyard has a strong inhouse design team of close to 100 designers. GRSE has built high-end platforms in the past, including frigates, missile corvettes, new generation anti-submarine warfare corvettes and landing craft utility ships for Indian Navy. It has the distinction of achieving over 90% indigenous content, on board ASW Corvettes and LCUs, a major step towards self-reliance in state-of-the-art warship design and construction. P17A Frigates are state-of-the-art guided missile frigates. Each of these ships will be 149 m long, with displacement of approximately 6670 tonnes and a speed of 28 knots. P17A Stealth Frigates are being built deploying the latest Integrated Construction Methodology with enhanced pre-outfitting to enhance quality and reduce build periods considerably. GRSE has appointed M/s Fincantieri, Italy as the know-how provider for technology upgrade and capability enhancement. GRSE has set sail towards a growth route in line with its vision to be a world class shipyard. The award of prestigious Project 17 A is a major leap for the shipyard in this regard. Continuing Research & Innovation, excellent product quality, world class modern infrastructure, and a strong corporate structure coupled with a competent & experienced human capital including around 100 in-house design engineers, promise a bright future for GRSE.